The right combo to fill out your spread. 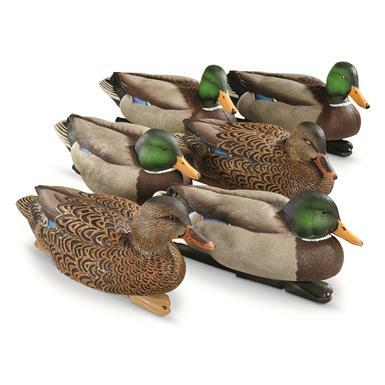 Whether it’s raining water or steel shot, these indestructible Decoys will ride out the storm unscathed and unbothered. Marine-grade foam fills each Decoy up to 100% capacity, so there's no wiggle room for even an extra drop of unwanted water. Fill 'em with shot, and the decoys will keep floating with lifelike movement on a weight-forward swim keel. Authentic looks, ultra-realistic paint scheme, and custom feather detail delivers results that'll fill your waterfowl quota.